The purpose of our motion analysis and retargeting research is to produce a new value in captured motion. 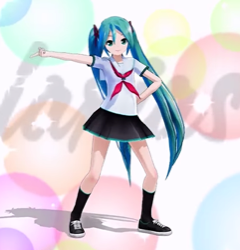 Not only transferring one motion to another character with original impression, but modifying an original motion to add a new emotion, to emphasize a limited feeling of cell animation and to append a professional sense, skill and arrangement to original dance motion have been challenged in this group. 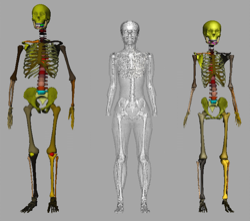 Volume data of human body and head captured by MRI is also the target to be challenged to estimate the location and shape of bone and internal organ to be regenerated in a different creatures. Limited feeling of anime like motion can be generated by the key-framing, its rearrangement and interpolation style. 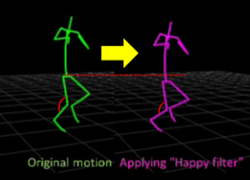 By emphasizing a joint motion angle and velocities, emotion and nuance in a dance sequence can be directed. 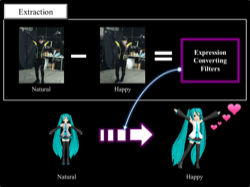 And also automatic dance generation along with a facial expression synthesis synchronizing with the music and dance in considering with a new skinning method which can generate dynamic feature of swinging blubber are featuring an innovative and leading-edge technique in computer animation.